The tee shirt has come a long way, Justin-Harvey.com has some of the most fashionable tees on the market. The actor Marlon Brando, wore a tee shirt in the 1947 stage production of "A Streetcar Named Desire" and is credited for having made the garment fashionable. 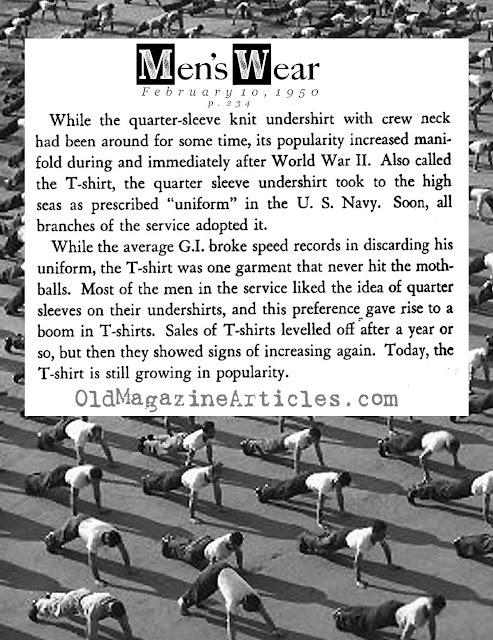 Below are two short paragraphs from a popular fashion trade magazine from 1950 pointing out that the white cotton knit crew-neck garment we call the T-shirt came into this world with the name "quarter sleeve" and had it's origin in the U.S. Navy, where it earned it's popularity and soon spread to other branches of the U.S. military during the mid-to-late 1930s. Tee shirts are a staple of every man's wardrobe and what a man considers a "great" tee shirt changes dramatically over time. As a child or teen, brightly colored tee shits with a logo or some silly comment are great. As an adult, a great tee shirt is one that fits well, is made from higher quality fabric with more sophisticated color choices. Men do not have to give up their favorite concert tee or other tee shirt they have had for decades that they can relive their youth through, we just suggest having a few tee shirts more suited to a mature man that exhibits style and not a product or band.